Many political commentators credit Donald Trump’s rise to white voters’ antipathy toward racial and ethnic minorities. However, we believe this focus on racial resentment obscures another important aspect of racial thinking. In a study of white Americans’ attitudes and candidate preferences, we found that Trump’s success reflects the rise of “white identity politics” – an attempt to protect the collective interests of white voters via the ballot box. Whereas racial prejudice refers to animosity toward other racial groups, white identity reflects a sense of connection to fellow white Americans. We’re not the first to tie Trump’s candidacy to white identity politics. But our data provide some of the clearest evidence that ongoing demographic changes in the United States are increasing white racial identity. White identity, in turn, is pushing white Americans to support Trump. When we talk about white identity, we’re not referring to the alt-right fringe, the white nationalist movement or others who espouse racist beliefs. Rather, we’re talking about everyday white Americans who, perhaps for the first time, are racially conscious. The concept of “garden variety” white racial identity stands in contrast to conventional wisdom. In the last three decades of scholarship on whiteness as a race, the prevailing view has been that most whites fail to notice their own whiteness. In a society dominated by white people, whiteness simply fades into the background. Just as fish fail to notice the water around them, whites are unlikely to think about how they are members of a distinct group. Our research shows that the era of “white invisibility” is coming to a close. Non-Hispanic whites are projected to become a minority in the year 2044. This increasing diversity across the country is making whites’ own race harder and harder to ignore. Political and social phenomena, from Barack Obama’s presidency to the Black Lives Matter movement, are making whiteness even more salient to white Americans. As whites increasingly sense that their status in society is falling, white racial identity is becoming politicized. Trump’s promise to “make America great again” speaks to these anxieties by recalling a past in which white people dominated every aspect of politics and society. That’s why media outlets from New York Magazine to The National Review have dubbed Trump an “ethnonationalist” candidate. To test our ideas about Trump and white identity politics, we surveyed a nationally representative sample of about 1,700 white Americans. The survey covered racial identities, attitudes and political preferences. In examining the relationship between white identity and ethnic diversity, we chose to focus on an ethnic minority of particular salience in contemporary politics: Hispanics. More than any other group, Hispanics have been in the Trump campaign’s crosshairs. 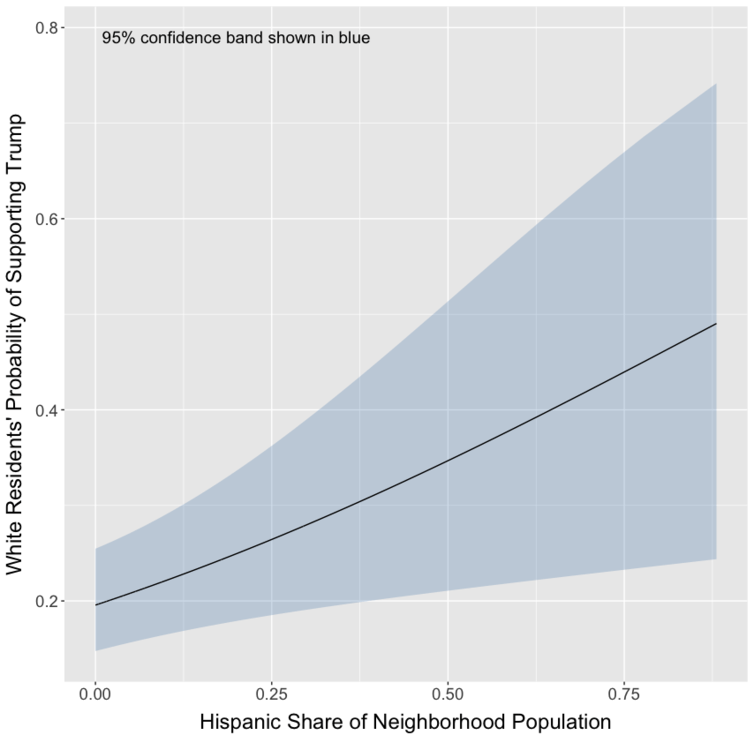 Do whites from heavily Hispanic neighborhoods show stronger white racial identity? To measure identity, we used a widely used questionnaire. On a five-point scale, participants rated their agreement with items such as “Being a white person is an important part of how I see myself” and “I feel solidarity with other white people.” As shown in the graph below, there is a positive relationship between exposure to Hispanics and white respondents’ sense of racial identity. 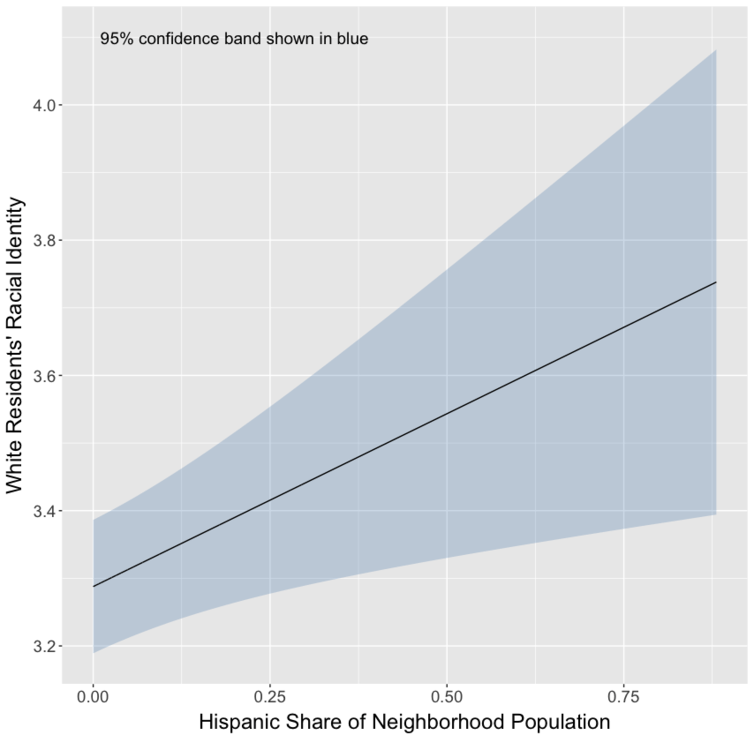 White identity is strongest in neighborhoods with a large Hispanic population. And does white identity lead to support for Donald Trump? We examined the relationship between white identity and respondents’ likelihood of supporting Trump for the presidency versus Hillary Clinton or several Republican primary challengers. Consistent with others’ analyses, white identity strongly predicts a preference for Trump. Strong white identity predicts support for Donald Trump. Whites at the high end of the racial identity scale are more than four times as likely to support Trump than those at the low end of the scale. Perhaps that’s because whites highest in racial identity are also the ones most likely to harbor negative attitudes against Latinos. Indeed, we found white identity was significantly correlated with another characteristic – prejudice. However, differences in prejudice don’t explain the relationship between white identity and Trump support. The pattern in the figure above was tested while statistically controlling for levels of anti-Hispanic prejudice. 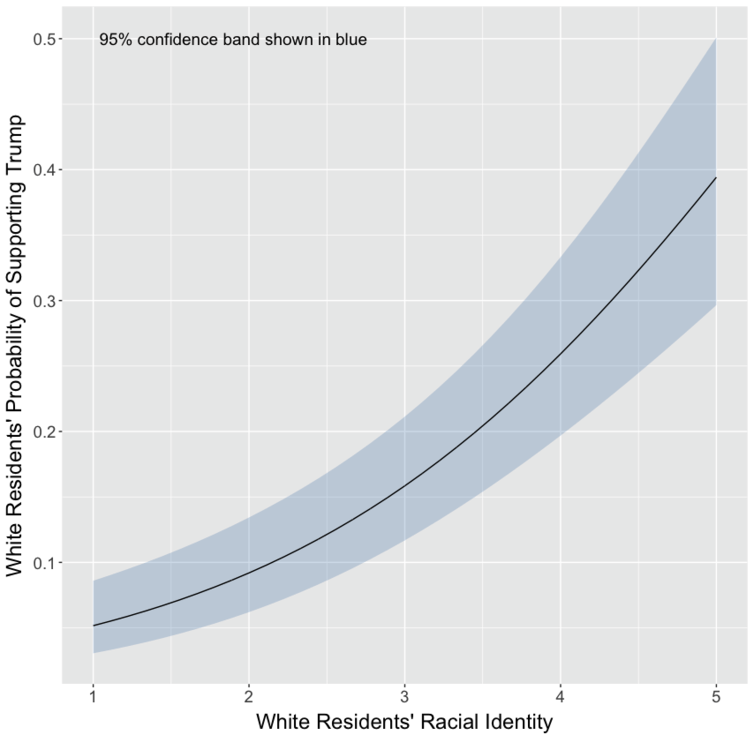 Because the relationship between identity and support for Trump remains strong, we are confident that white identity independently predicts greater Trump support. We’ve seen that living close to Hispanics leads whites to develop a strong sense of racial identity and that strong racial identity is associated with support for Donald Trump. We should therefore expect whites in heavily Hispanic neighborhoods support Trump more often than those in neighborhoods with fewer Hispanics. This prediction gains credence from work by political scientist Ryan Enos, who finds that everyday exposure to Latinos can increase support for restrictive immigration policies. Whites’ support for Donald Trump is, in fact, greatest in areas with a large Hispanic population. Whites’ support for Donald Trump is greatest in areas with a large Hispanic population. These findings leave open a crucial question: Do whites in heavily Hispanic neighborhoods support Trump because they tend to be high in white identity? Using a statistical approach called “mediation analysis,” we tested whether white identity accounted for the relationship between exposure to Hispanics and support for Trump. We found that identity does indeed serve as a significant link between Hispanic exposure and Trump support. Trump, despite his outsize importance as a candidate and symbol, will eventually fade from the political scene. We therefore sought to examine the interplay of demographics and identity beyond the context of his candidacy. Specifically, we asked respondents for their views on white identity politics itself. Exactly the same patterns emerged for these questions as for Trump support: Endorsement of white identity politics was highest in heavily Hispanic neighborhoods and was strongly correlated with white racial identity. These results suggest that America’s growing ethnic diversity is creating a politicized form of white identity that has clear repercussions for future elections. Why does it matter that whites’ politics are driven by concerns about the interests of their racial group? It suggests that racial bias increasingly reflects attention to the welfare of one’s own group rather than animus toward other groups. These collective concerns are only going to become more pronounced as the nation becomes more diverse. Recent research in social psychology suggests that when whites engage in discrimination based on their perceived collective interests, it’s hard to convince them that such discrimination is wrong. After all, doesn’t every group have a right to prioritize its own members? We believe our results portend increasing difficulty in achieving the democratic aim of getting race out of American politics.